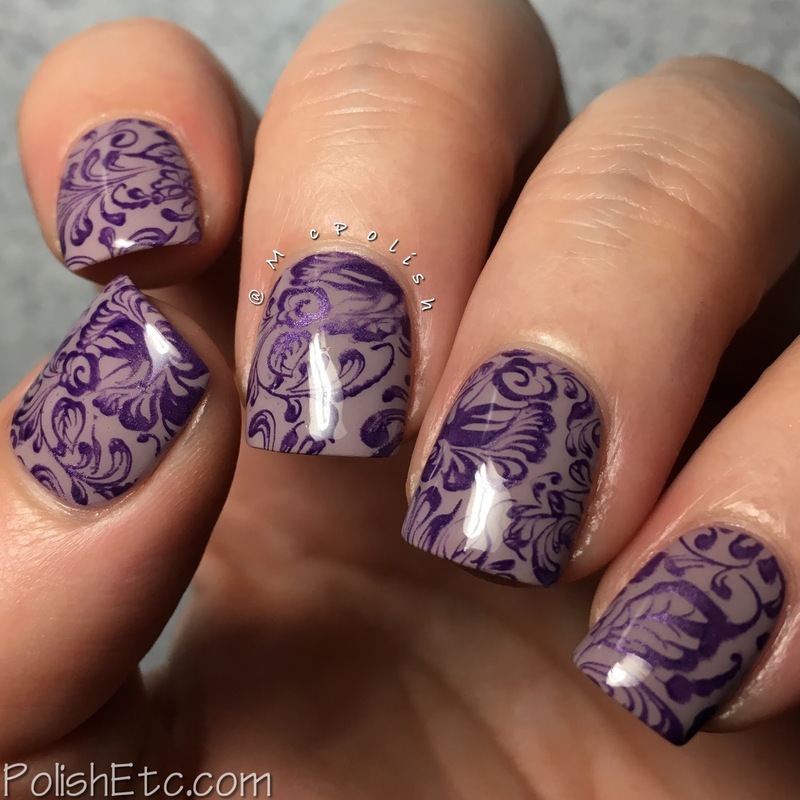 Delicate Print Nails for the #31DC2018Weekly - Polish Etc. 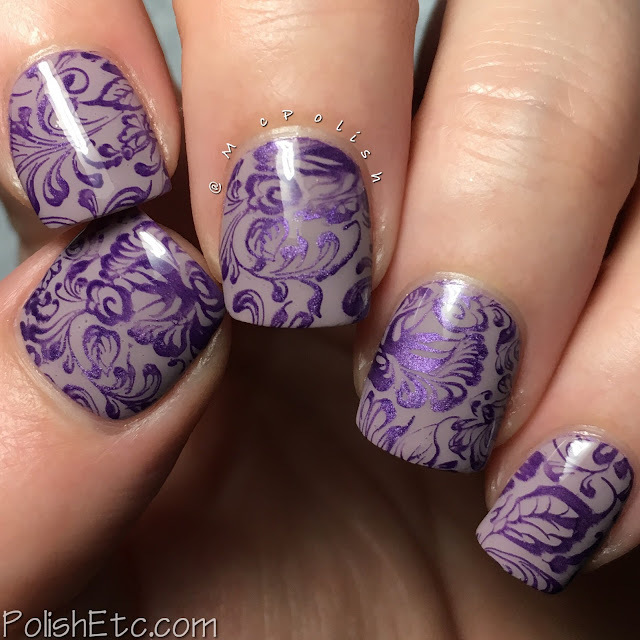 I have a simple little stamping mani to share with you today for the delicate print prompt of the #31DC2018Weekly. I tend to be drawn to stamping plates with delicate floral or abstract images. They stamp well and you don't have to be very precise with them. You get a fly manicure every time! For this look, I started with a base of Zoya "Easton" which is a purple toned medium grey creme. Then I used a pretty floral image from the UberChic Plate 17-01 which had lots of swirls and vines and flowers for the stamp. The polish I used for stamping was a magnetic shade from Bow Polish called "Motivation". It stamped very nicely but the magnetic effect was not strong. I haven't tried it out as a full mani yet. But it is a pretty purple. Everything is topped off with a glossy top coat. Do you see how long there nails are?!?!?! They are driving me bananas. I was planning on nubbinizing this past weekend but was too busy at work. Plan on seeing these babies go this week before Polish Con! We are offically half way through the challenge! There are 16 weeks left. Still plenty of time for you to catch up with you want to join in. Or just go ahead and do the weekly prompts starting now. 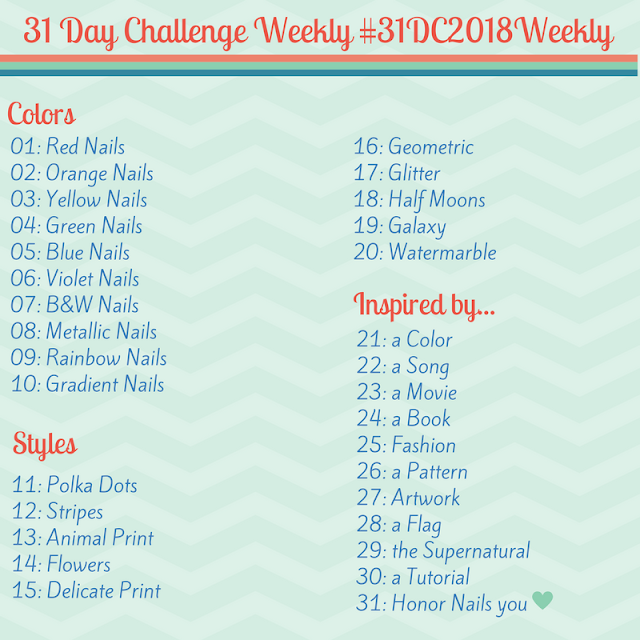 See everyone else doing the challenge with the tag #31DC2018Weekly on Instagram, Facebook and Twitter. Plus...be sure to check out what my German bestie, Lotte, is creating each week on her blog!